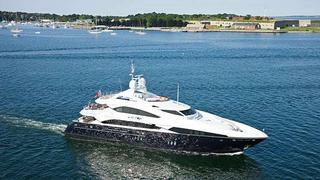 News just in from Rick Obey at Rick Obey & Associates that he's sold the 36.8m tri-deck yacht Just J's. Built by Sunseeker in 2009, she accommodates 10 guests in a main-deck master suite, two double staterooms and two twin cabins, while twin MTU 12V 4000 M90 engines give her a cruising speed of 20 knots. Just J's was asking $13,999,000.